Blazing Bazukas is the nineteenth level in Donkey Kong Country 3: Dixie Kong's Double Trouble!, and the fourth area of Mekanos. The Kongs will meet up with Bazukas for the first time in this factory. 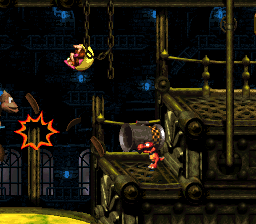 Although they must typically avoid their attacks, sometimes the Kongs can put the Bazukas' Barrels or Steel Kegs to good use, like crossing gaps or nabbing the level's DK Coin. They may need to use Switch Barrels first though. Squitter will also be needed to access a bonus area. Krimps and Buzzes can also be found here. The level begins one simple barrel-shooting Bazuka that leads up to a barrel that will shoot the monkeys onto a rope, which has a DK Barrel to the far left. The Kongs should continue east, then they fall down, continue east, and defeat a Krimp. Continuing east, the apes must use the help of a Bazuka's barrels to cross a pit of lava. From here is the letter K and two shooting barrels. While in the second, the player must use good timing to decide when to grab onto the rope being hindered by a Bazuka and it's TNT Barrels. If the Kongs fall down, they will fall into lava. Going east, the Kongs will find a barrel that will shoot them up to a No Squitter Sign, which is odd, since Squitter is not found beforehand. Continuing west, there will be a TNT Barrel, which can be used to protect against a Bazuka attacking with the same weapon. Right behind the Bazuka the Kongs can turn into Squitter. Using Squitter, they can get the nearby letter O. Going west, there will be a barrel, that, if jumped into, will allow access to two platforms. On the one to the Left there is the Star Barrel. If the apes go left after the Star Barrel, they will find a Buzz, which can be easily defeated with Squitter. The Buzz here is guarding a Switch Barrel. When the barrel is touched it will turn the TNT Barrels of a Bazuka found across a gap to the right into normal barrels. The monkeys should then go to this aforementioned Bazuka, and use it's barrels to jump across to the other side. With Squitter, this is not necessary. He can just fall down and walk to the right, make a web platform, and hop over the Bazuka. Past here is the No Squitter Sign, which will give the Kongs a Bear Coin. Continuing east, the monkeys will pass a Krimp, and then climb onto a rope on which they must jump over the TNT Barrels from a nearby Bazuka. Just above the Bazuka is a barrel which will shoot Dixie and Kiddy onto yet another Bazuka. This one also shoots TNT Barrels, and the Kongs must shoot past them to fall and find some Bananas. Continuing west, they will find the letter N and a barrel that will shot them up to a rope. They must go west on this rope to avoid a Bazuka, and, after falling down, find a DK Barrel and two Krimps. When they go east, they must shoot up to avoid two more Bazukas. After going east from the last Bazuka the fall down past a Bazuka and find two Krimps. Past these Kremlings is a bazuka that will lead to a barrel with the letter G and the final Bazuka in the level. Past here is the flagpole. Right after the Kongs become Squitter, Dixie and Kiddy should backtrack to where they find a high, open ceiling. Squitter must make web platforms to find this Bonus Area. In the Bonus Area, the apes must make webs to stand on to avoid molten lava pits while shooting to kill some Buzzes. As usual, at the end there will be a Bonus Coin. Getting to this Bonus Area is extremely difficult and requires precise timing. The Kongs will find a DK Barrel near some Krimps. They must then jump into a nearby barrel, and hold the control stick (or D-Pad in the GBA version) left, this will allow Kiddy or Dixie to bounce off a barrel into the Bonus Area. If Dixie is in the player's team, they can avoid all of this hassle by jumping on the ledge above the Bazuka and simply twirling across the entire gap. Despite being hard to find, this bonus area is quite easy. The monkeys just have to shoot themselves up to a makeshift bridge of barrels, hop over them, and they will find a Bazuka and a Bonus Coin. Just before the Star Barrel, if the Kongs decide to not go all the way up, and land halfway up and to the left, they will find Koin being bombarded with barrels. Squitter must be used to hop across to the other side where there is a Switch Barrel the turns the Bazuka's barrels into Steel Kegs. From here, if the Kongs stand on top of Koin, he will not see the incoming keg, giving the apes the DK Coin. K: Found after the second Bazuka in the level. O: High above the ground proceeding Squitter's Animal Barrel. N: Proceeding two Krimp, the "N" Letter is above an Auto Fire Barrel. G: Following brief tightrope climbing with a Bazuka that shoots TNT Barrels, the "G" Letter is above a barrel cannon. This page was last edited on April 10, 2019, at 13:30.